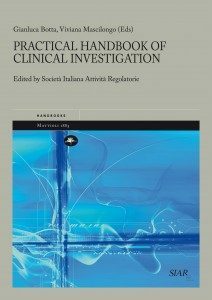 E’ acquistabile online il Volume Practical handbook of clinical investigation, a cura della SIAR – Società Italiana Attività Regolatorie. A brevissimo lo potrete trovare anche sui maggiori siti di vendita online (Amazon, IBS, Hoepli, …). La normativa per la sperimentazione clinica ha subito profondi cambiamenti negli ultimi anni, con modifiche sia nelle figure responsabili per l’autorizzazione che nelle procedure da seguire per l’ottenimento delle autorizzazioni necessarie. Questo volume nasce dalla necessità di colmare un vuoto editoriale e di avere a disposizione un testo di riferimento che sia utile per chiunque si affacci al mondo della sperimentazione clinica: per il neofita e per chi avverta l’esigenza di rivedere o approfondire tematiche e concetti già noti. Il Manuale tratta gli aspetti della sperimentazione clinica per le diverse tipologie di prodotto (medicinale ad uso umano, dispositivo medico, medicinale veterinario, cosmetici, nutraceutici, …) senza tralasciare gli aspetti normativi fondamentali e le conoscenze teoriche necessarie (metodologia ed etica, sicurezza nelle sperimentazioni cliniche, metodi statistici). The clinical trials legislation has undergone significant changes in the past years, both in the figures responsible for the authorization process and the procedures to obtain the necessary authorizations.This volume comes from the need to cover an editorial gap and make a reference book available that could be useful for anyone working on clinical trials: for the novice and for those who feel the need to review or investigate themes and concepts already known.The manual deals with the aspects of the clinical trial for the different types of products (medicinal products for human use, medical devices, veterinary drugs, cosmetics, nutraceuticals, …) without forgetting the fundamental regulatory rules and the necessary theoretical knowledge (methodology and ethics, safety, statistical methods). Qui di seguito riportiamo la Prefazione del Prof. Adriano Chiò. Randomized clinical trials (RCTs) represent the gold standard for showing safety and efficacy of novel therapeutic molecules and, in the last years, also of innovative cellular and genetic therapies. The juridical regulation of scientific experiments on hu­mans has a relatively short history. It is mainly based on the trial of Nazis physicians, which has been hold between December 9, 1946, and August 20, 1947, in Nuremberg, Germany. The trial procedures were jeopardized by their frail juridical bases: in fact, from one hand the severity of the charges on the defendants was so strong to legitimate foreign countries to put in trial citizens belonging to another nation (on whom theoreti­cally they had no legal rights), on the other hand it was not clear what could be the legal background to charge them on the ground of war crimes or crimes against humanity, for which there was no legal statute. It was the American neuropsychiatrists Leo Alexan­der, one of the members of the War Crimes Board, that wrote the first six principles, to which four more were later added, that constituted the Nuremberg Code. On the basis of this Code the International Court judged the defendants.The principles of the Nuremberg Code were later modified, initially with the Hel­sinki Declaration (1964), and later with the current European and American legislation, the so-called Good Clinical Practice (GCP), which represent the standard of RCTs.GCPs state the protection of human beings as participants to clinical trials and also guarantee the reliability of the data generated by clinical trials. The guidelines state how clinical trials have to be managed, and define the role and responsibility of sponsors, monitors and researchers.The current GCPs have been criticized because they are considered too technical and more deficient in term of moral principles when compared to the original Helsinki Declaration (in particular concerning the conflict of interest statement; the reporting of the benefits for the individuals participating to the trial; the duty of publication of the results of the clinical trials, notably the negative ones; the right of the patients to have free access to the treatment after the end of the research; and the limitation of the use of placebo exclusively to the clinical trials for which there are not effective therapeutic alternatives).Other criticisms arise from patients and public opinion, who do not easily accept the use of placebo, and also the complexity of bureaucratic procedures, that necessarily cause an increase of time needed both for the conduction of the trial itself and, more important, for the approval and the commercialization of drugs.From the point of view of the researcher, RCTs are a clear opportunity of cultural improvement, but also a quite complex activity, in which he or she has to disentangle between multifaceted regulations, demanding local ethical boards, and monitors who are sometimes felt as overly meticulous. However, despite these problems, RTCs re­mains an unique instrument for introducing in clinical practice drugs whose safety and efficacy have been tested with a reasonable level of confidence.This handbook, written by authors expert in the areas of regulation and monitoring of GCPs and RCTs, offers answers to several uncertainties and conundrums expressed by patients and researchers, but, most important, it represents a reference point for the sensible and difficult process of the RCT implementation. The text, which starts with an historical overview of clinical tests on humans, reviews the different types of pharmaco­logical studies with their advantages and limitations, and discusses the ethical aspects of experimentations on human beings.A detailed chapter is devoted to GCPs, a quite complex area, as it has been noted before, which is nonetheless essential not only from the technical point of view of moni­toring, but more importantly for the actual activity of experimentation at the single clinical centers. In this regards, it should be mentioned the section concerning the audit performed by regulatory authorities (AIFA in Italy, EMA and FDA in Europe and USA, respectively), which is perceived by the researchers as an arduous examination. Very interesting is the chapter regarding the clinical trials on children, which have specific regulations; this is a rapidly growing area of research, in particular because of the large number of novel molecules potentially effective on metabolic disorders of childhood that are now under development. For the clinicians interested in rare disorders, the section discussing the procedures for the compassionate use of drugs is enlightening. Italian regulations and European legal framework are reported in great detail but also quite clearly. This chapter clari­fies the bias of the Italian regulations, that allowed several courts to rule the use of non-validated therapies on basis of a misinterpretation of existing laws, with negative consequences for the public health and also for the national budget. At last I have to mention the section concerning the innovative therapies, such as gene therapy, cellular therapy and tissue engineering. These treatments, that have been properly defined the new frontier of therapy and often sponsored by small high technol­ogy companies, need highly complex procedures both related to drug preparation (cell factories) and to the administration to patients. This handbook represents also a useful dictionary for the clinical researcher who needs to disentangle in a complex rapidly changing terminology, rich of abbreviation, such as SUSAR, AIC, GMP, DSUR, and sometimes ‘exoteric’ words. Congratulations to all the authors and editors of this handbook, which will for sure represent an essential reference for the clinical research in the next years.